I actually never expected to see another copy. Not that the record is particularly sought after, but it´s rare and just never turns up. Well, last week I finally found one, at a Berlin record fair. Ironically, it was the first record I picked, when I absent-mindedly let my hand wander through a box of cheapo 45s. Usually I never bother with cheap records at record fairs, because there is too much high quality stuff to choose from already. Even though I had never seen the sleeve, I recognized the record immediately. It looks like it´s never been played and the sleeve is in good condition too. I paid 1 Euro. Only a handful of German guitarists like Ladi Geisler, Coco Schumann, Dieter Resch, played this style in the 1960s. None of them ever made it big. On top of that, Fritz Woelffer´s Date 45 unfortunately fell out of time. Instrumental rock was long out of style, when it came out. Contrary to what I assumed six years ago, the record is not from the early, but from the late 60s. Both songs seem perfect. 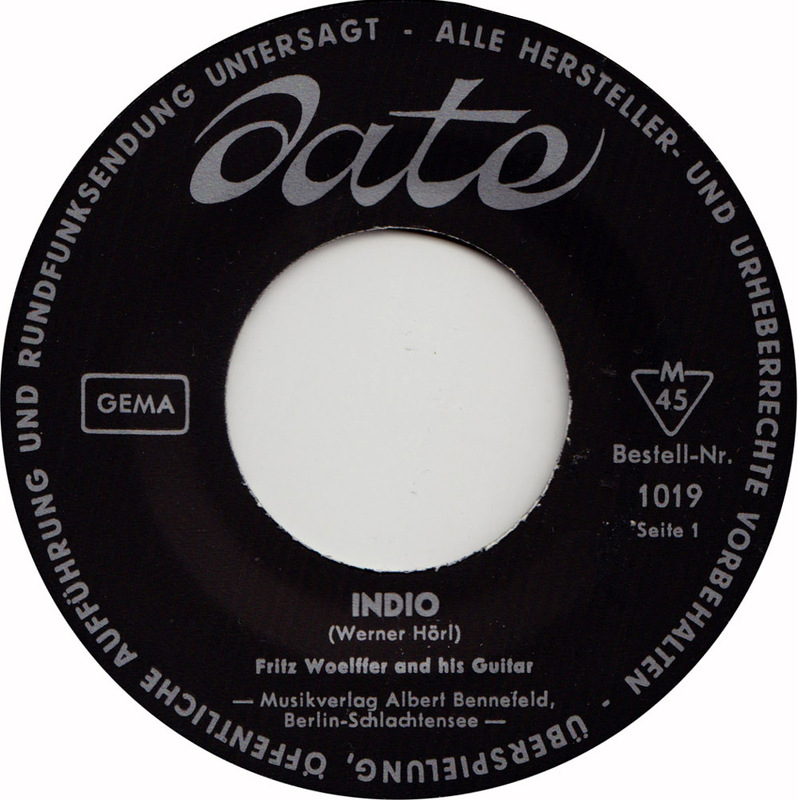 Indio is a seamless Western-movie themed tune. County is a sweet little tune, that apart from what the title suggests, also features bass, organ and drums. But it was all in vain. The odd sleeve probably didn´t help sales either. 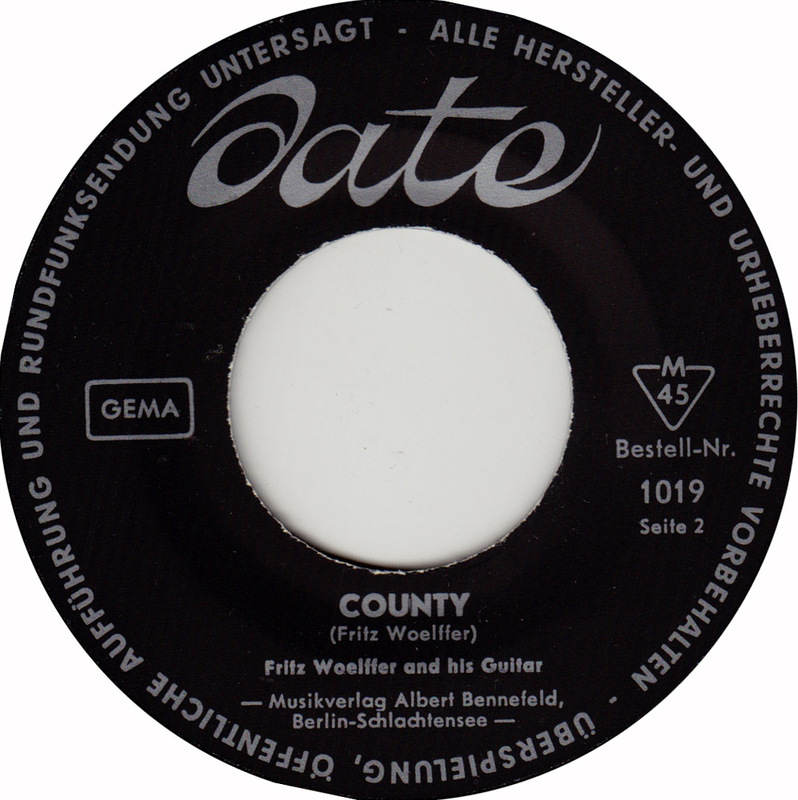 Fritz Woelffers only solo record went completely under the radar. 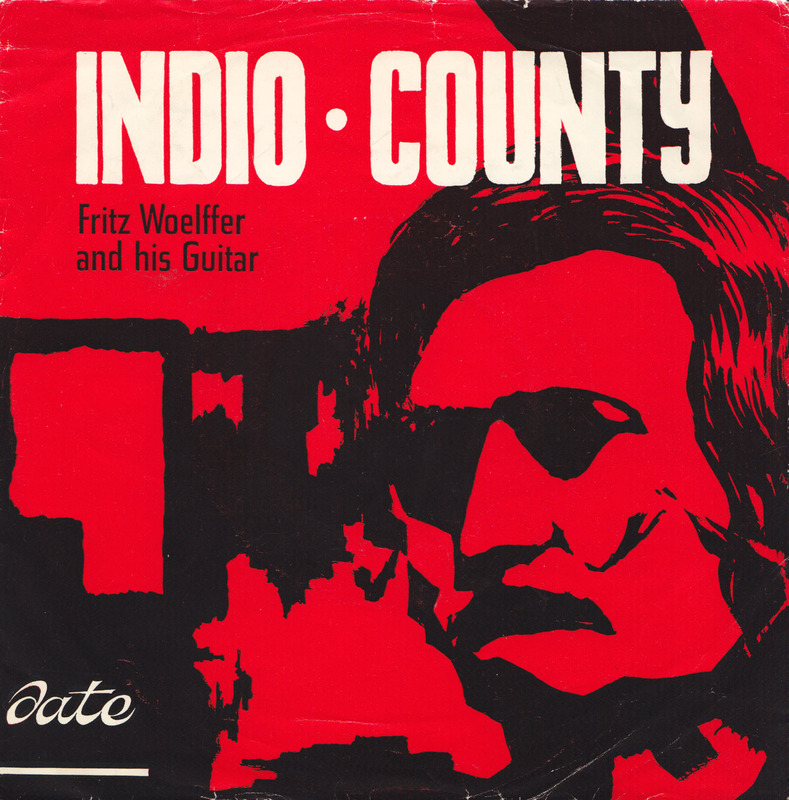 Fritz Woelffer was a well-known local session musician. In the late 40s he played guitar with the Heinz Becker Barquintet and recorded a bunch of sided for Amiga. 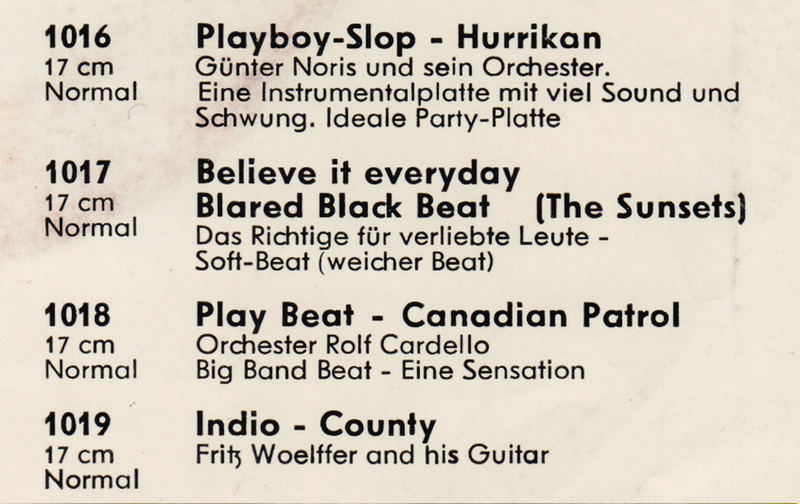 So Woelffer was from Berlin, but I´m not so sure, that these songs were recorded in Berlin any more. The record was published by Albert Bennefeld out of Berlin-Schlachtensee, but the back of the sleeve lists one Hermann Will (date-Tonproduktion für Schallplatte, Funk und Fernsehen, 8662 Helmbrechts), as the producer. So the date label was obviously from the small town of Helmbrechts, in the Upper Franconia region in the state of Bavaria. My first copy of this record was so scratchy, that I didn´t even notice it was in stereo and recorded it in mono. Now, I re-recorded both sides in glorious stereo. Wonderful single….thanks for sharing it. If I did not know the source of the B-side, I would have identified it as a Norman Petty (Clovis, New Mexico) production such as The String-A-Longs or the more easy-listening side of The Fireballs. I’m guessing the artist was a fan of those records. The organ even reminds me of Vi Petty’s playing on those recordings. For me, that style really is timeless (although for most, it’s anchored in the late 50s/early 60s). Thank you for the very good scans and the very rare & strange records! Indio meandert ein bischen, aber nett. 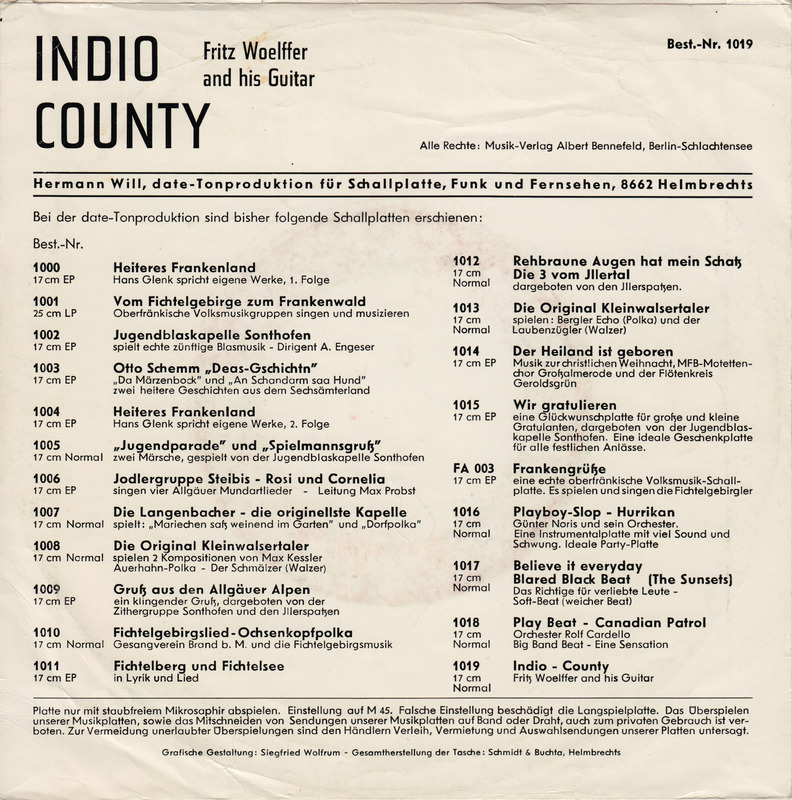 Nur eine Handvoll deutscher Gitarristen, wie Ladi Geisler, Coco Schumann und Dieter Resch, spielten diesen Stil in den 60er Jahren. 2014 spielt ihn nur Kahuna Kawentzmann.